As a diabetic, fitness and workout junkie, health nut, etc, I don’t eat brownies or particularly like them. I am clearly in the minority. At an office party, get – together, dessert buffet, or whatever the friendly gathering, brownies never stand a chance. If you run out of anything, it’s brownies. And they’re usually the first to go. People love them. Moist, chocolaty, rich, gooey… delicious. And finger food. Anything bite sized is successful. It’s fun to eat and maybe gives us the illusion that smaller portions have less calories. 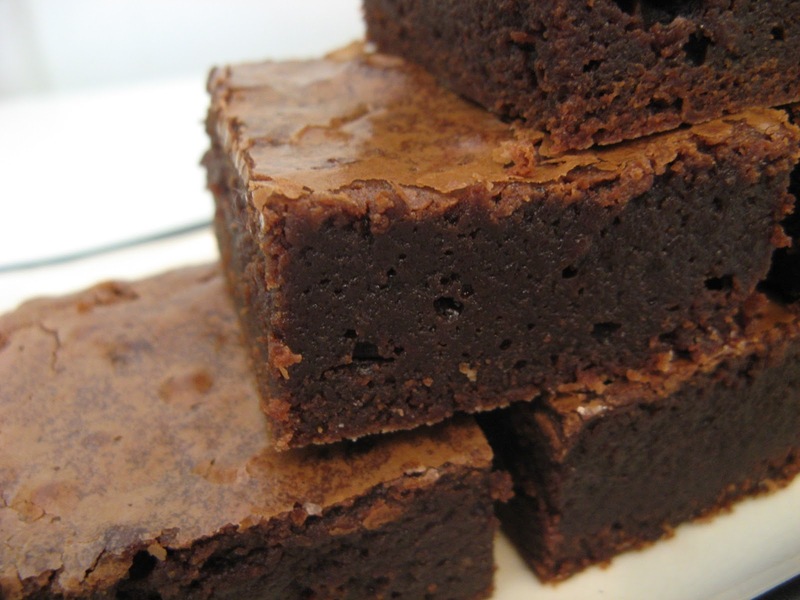 Brownies are also highly customizable. Different combinations of chocolates, fillings (mint, health, caramel, fudge, white chocolate, marzipan, just to name a few), nuts, toppings, whole chocolate chunks… whatever you want to add to make it yours. This is all great, but you need a fantastic ‘base’ or platform from which to launch your own brownie. I think this recipe is it. Once you get it down and are happy with it, put your personal touch on it and call it your own. Regarding this recipe, it is NOT mine. Chef Thomas Keller gave this recipe his full endorsement, and therefore, any self-respecting chef should do the same. Chef Thomas Keller, of the French Landry, Bouchon, and Per Se, is arguably the best chef in America, if not the world. I feel more than confident in posting this recipe, and I’m sure that if you are looking for an incredible brownie, look no further. 2. Butter and flour a 9 in baking dish. 3. Sift together the flour, cocoa powder and salt. Set aside. 4. Melt half of the butter in a small saucepan over medium heat, stirring occasionally. Put the remaining butter in a medium bowl. Pour the melted butter over the bowl of butter and stir to melt the butter. The butter should look creamy, with small bits of un-melted butter, and be at room temperature. 5. In the bowl of a stand mixer fitted with a paddle attachment, nix together the eggs and sugar on medium speed for about 3 minutes, or until thick and very pale. Mix in the vanilla. On a low speed, add about 1/3rd of the dry ingredients, then add 1/3rd of the butter, and continue alternating the remaining flour and butter. Add the chocolate and mix to combine. 6. Spread the batter evenly in the pan. Bake for 40-45 minutes, until a cake tested or wooden skewer poked into the center comes out with just a few moist crumbs sticking to it. Cool in the pan until the brownies are about room temperature. 7. Invert the brownie onto a cutting board. Cut into 12 rectangles. Dust the tops with powdered sugar.